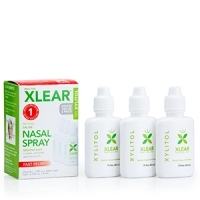 Xlear Inc. was founded in June of 2000 to launch the company’s first commercially available product, Xlear Sinus Care Nasal Spray. Since that time, Xlear has grown to be recognized as an industry leader in the manufacturing and distribution of high-quality, natural xylitol products. Dr. Alonzo H. Jones, D.O., a family physician in west Texas, now retired, was trying to find a solution for the people coming to see him for upper respiratory issues. He studied the research pointing to the benefits of xylitol for improving oral health and its effects on bacteria. He noted that upper respiratory problems had been steadily increasing since the early 1970s, owing to environmental factors that included poorly conceived drug therapy and growing antibiotic resistance. He also understood that most upper sinus and respiratory problems were linked to chronic, inadequate nasal hygiene. Studies show that 90% of moisture and bacteria enter through the nose. He set out to find a preventative treatment to address these growing problems. The solution was Xlear. Now in an improved pump-mist bottle! 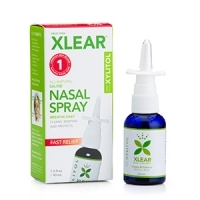 Xlear (pronounced 'clear') is a patented, non-addictive nasal spray designed to aid in the relief of irritation caused by pollutants, allergens and germs in the nasal passages. It is the ONLY nasal spray that has combined an effective amount of XYLITOL and the health-promoting practice of a saline to help wash, hydrate, and moisturize the nasal passages. 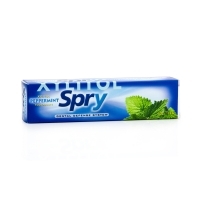 Cool and refreshing Spry Spearmint Oral Rinse with all-natural Xylitol- a great-tasting natural sweetener with unique dental benefits. Our new oral rinse contains no polysorbate or sodium benzoate! It's quick and easy to use, a 30-second rinse with Spry Spearmint Oral Rinse reaches parts of the mouth that may be missed by brushing alone. 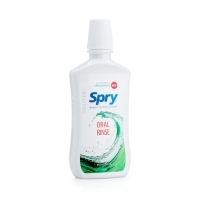 Used daily, Spry Spearmint Oral Rinse helps wash away bacteria and keeps your mouth fresh and clean. Purified water, Xylitol, Grain alcohol (ethanol), Spearmint flavor (blend of natural extracts), Vegetable glycerin (from non-GMO palm fruits), Calcium Glycerophosphate, Aloe barbadensis juice concentrate (Aloe Vera), Calendula officinalis (Marigold) flower extract, Chamomilla recutita extract, Echinacea purpurea extract, Olea europea (Olive) leaf extract, Thymus vulgaris (Thyme) extract. For best results follow brushing with Spry Coolmint Oral Rinse (link). 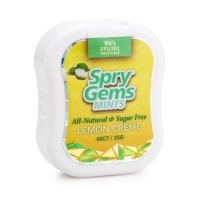 Enjoy the delightful citrus taste of lemon in our new Spry Lemon Crème Gems mints! We combined the health properties of xylitol with a tasty, pH-balanced formula to maintain healthy teeth and gums. Xylitol promotes dental health and may reduce the risk of tooth decay. Use with the Spry Anti-Cavity Toothpaste, Spry Coolmint Oral Rinse, and Spry Chewing Gum. 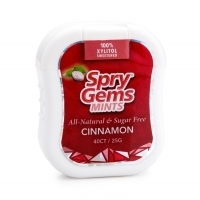 Cinnamon Spry Gems provide a burst of powerful cinnamon flavor in a tiny candy (no mint flavor) that is sweetened with 100% xylitol! Spry Gems combine the tooth-protecting properties of xylitol with a tasty, pH-balanced formula to maintain the health of teeth, gums and oral tissues. Xylitol actually promotes oral health and may reduce the risk of tooth decay. 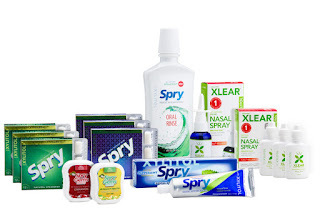 Use with the Spry Coolmint Toothpaste, Spry Coolmint Oral Rinse, and Spry Chewing Gum. Soothing, cool mint flavored sugar-free chewing gum sweetened with 100% xylitol. Great-tasting flavor makes Spry Chewing Gum the gum of choice for fresher breath and healthier teeth and gums! Studies have shown that when combined with normal dental hygiene, regular use of xylitol gums may reduce the risk of dental caries! For best results use with the Spry Coolmint Toothpaste and Spry Coolmint Oral Rinse. A refreshing, candy-cane flavored sugar-free chewing gum sweetened with 100% xylitol. 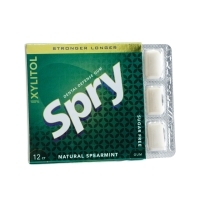 Great-tasting Spry Chewing Gum--the gum of choice for fresh breath and healthier teeth and gums! Studies have shown that when combined with normal dental hygiene, regular use of xylitol gums may reduce the risk of dental caries! I love all of Xlear's products! I love that their nasal sprays are all natural and non addicting. You wouldn't think a nasal spray would be something you could get addicted to, but having been addicted to nasal spray after having a terrible cold I will never use anything but Xlear's natural nasal spray. Xlear's nasal spray soothes your nasal passages and helps to keep them hydrated which is a great thing if you live in the Arizona desert like I do. I'm also a huge fan of the Spry mouth wash! I love that it washes away bacteria without that harsh burn you get from other non-natural mouthwashes on the market. The toothpaste helped to freshen my breath and my teeth felt squeaky clean. One of my favorite products by this company is their Spry Gems. I love mints but these taste more like candy to me and thanks to them being sweetened naturally with xylitol I don't feel guilty eating them. They make my mouth feel clean and healthy instantly after popping one in my mouth. 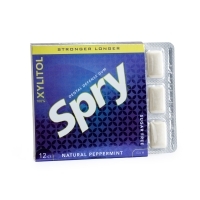 Spry's gum with xylitol is just as sweet as other gums but helps your teeth to stay healthy and freshens your breath. Don't forget to order your kit with the special offer below for a limited time! Purchase the Xlear Care Kit, valued at $65, for only $25 now through June, 30th 2015. Click here to take advatage of this special offer. Follow Xlear on social media!